"It requires about thirty seconds of intelligent consideration to realize that a case of circumstantial evidence is not a "chain" at all. In a chain, each link depends on the one preceding, and supports the one following. But with circumstantial evidence a number of more or less unrelated items -- facts, objects, incidents -- point in a certain direction, and indicate the truth. It is the accumulation of a number of these which makes the whole conclusive." 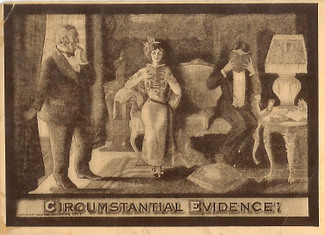 --Edmund Pearson, What Is Evidence? Bugliosi on Kennedy, Well Interviewed A highly qualified interviewer made an interviewee of Vincent Bugliosi on his book, Reclaiming History: The Assassination of President John F. Kennedy , and the result has been published on the History News Network website. He says: "Everything pointed toward Oswald's guilt. All the physical evidence, all the scientific evidence. Everything he said, everything he did.... It would not be humanly possible for this man to be innocent and still have 53 pieces of evidence pointing toward his guilt. Only in a fantasy world can you have 53 pieces of evidence pointing toward guilt and still be innocent." Death Row Mugshots A new book displays the photographs of every person the State of Texas has executed since 1972, and given its size and the zest with which it applies the ultimate penalty, Texas Death Row : Executions in the Modern Era runs to 204 pages. One reviewer remarks that the book "is merely a distillation of the public domain information preserved by the Texas Department of Criminal Justice." Some Amazon reviews denigrate the author as "unethical" because the information the book contains is readily available from the internet. I'm not sure what to make of that criticism; certainly it's easier to read a book than a computer screen, but if not supplemented with some original work on the part of the author, perhaps the remark is valid. The book is also characterized as "neither pro-death penalty nor abolitionist in stance." I'm not so sure that a book offering photos of the condemned that does not include photos of the victims could meet that description. A Cautionary Note For Encyclopedia Authors Seeking Reviews I will not begrudge an inch of free space to a book that does not pass the litmus test of accuracy. While I like crime encyclopedias, 92% of them disappoint. Ladies and gents, please do not waste my time or a copy of your precious book unless you can swear on all you hold dear that it is thoroughly accurate, or I may unleash my growing irritation and start naming these bad titles, beginning with yours, which wouldn't be very nice. Guys, just wanted to give you a head's-up that my book, FACES OF EVIL, Kidnappers, Murderers,Rapists and the Woman Who Helps Put Them Behind Bars, which I co-authored with Houston P.D. forensic sketch artist Lois Gibson, is now available in paperback at Amazon.com and at Barnes & Noble. I appreciate the plug given earlier when I wrote a TPM Cafe blog about ghost-writing and how it applied to the Petraeus report. FACES is a fascinating look, not just at an extraordinary and talented artist, but at a number of high-profile cases she helped solve. Lois Gibson took a horrific sexual assault that happened to her as a young woman and used it to empower her work and enable her to coax out the worst from crime victims. Her work has been spotlighted on Dateline, NBC, and she's been tapped by the F.B.I. and America's Most Wanted. We know of at least 1,000 bad guys Lois helped catch. It's an engrossing read. Hope you guys enjoy it.